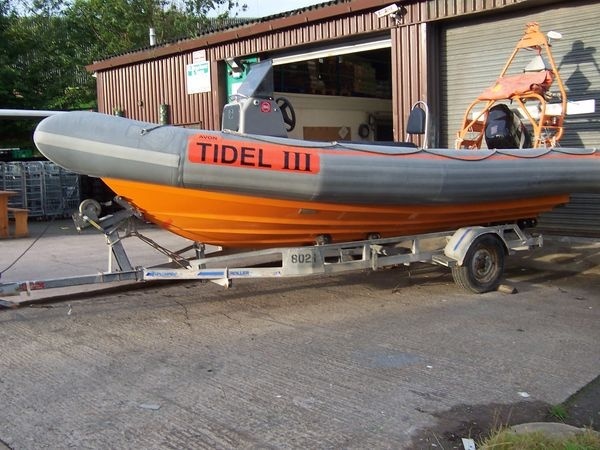 We can carry out the complete range of rib repair, rib tube repair and rib boat repairs. Whether its a valve leak, minor rib tube puncture, a major tube tear or rib tube seam leak, we have the skilled staff to repair your rib tubes quickly and get your inflatable back in the water. Many minor inflatable tube repairs can be done yourself and we stock a range of the required accessories for DIY rib repairs as well as add on accessories for your RIB. Contact us for advice on the best options for repairing your rib boat. Our local area is South West Devon which includes Dartmouth and the River Dart Estuary upto Totnes, Brixham and Torbay district, Salcombe and Plymouth harbour district in Cornwall and also the river Exe Estuary upto to Exeter. We can supply materials UK wide. 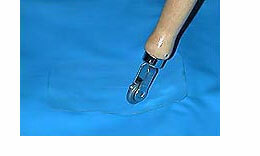 TIDEL can carry out all RIB puncture repairs or we can supply the required materials for DIY RIB repairing. Small punctures upto 2 inches in length will require an external patch. RIB repairs longer than 2 inches in length will require an internal patch and an external patch. Trying to repair a tear longer than 2 inches with only an external patch may hold for a short while, but eventually the repair will fail. As there will be fine dust created during this process, a breathing filter should be worn to protect from inhalation of the dust. A rib repair patch should be cut to a size allowing 5cm (2 ins) all around the tube tear. The patch should be cut with rounded corners as these will glue better and will not be snagged as easily as sharp corners. The side to be glued should be sanded to give a dull surface which is they key for the hypalon glue. The patch area should be traced out on the tube. All surfaces should be sanded just enough to give a dull surface finish. This surface is the key for the hypalon glue to attach itself to. Do not sand through the top layer or you will expose the high tensile fabric fibres which will not provide a strong bond. The prepared surfaces must be cleaned of all traces of dust, grease, finger oils etc before gluing. The glue should be mixed with the hardener/catalyst according to manufacturers directions. Both surfaces should be coated with a layer of glue. Not too thin but also not too thick. The glue should be allowed to go past being tacky before it is ready for a second coating. If you touch the surface of the glue lightly with a knuckle it should not stick to your skin. If it does then the glue has not gone off enough. A second light coating of glue is then applied to both surfaces and allowed to start going off. When the glue surface becomes non tacky, it is ready to be joined. Do not touch with fingers as fingers leave oils on glue surface which spoil bonding. The glue is a contact glue and once the two surfaces are pressed together they will not come apart easily. Apply the tube repairing patch carefully over the tear making sure the two sides of the tear are in contact. Then press down firmly in the center of the patch and apply pressure working outwards to the edges. A hard rubber or metal roller is then used to roll the patch from the center outwards in all directions. This pushes all air bubbles out and ensures full contact between the two surfaces. The rib repair patch should then be rolled in all directions firmly. Excess glue should be removed from around the edge of the repair patch using a soft rotary brush as can be seen in our RIB Accessories pages. Glue should be allowed to cure before inflating. See glue manufacturers recommendation for curing period. If your RIB tube is the glued on type, it may occasionally become detached from the hull. In this event the RIB Tube repair is a simple case of cleaning both surfaces of all sand and salt and sanding both surfaces to a dull finish before re-gluing. All traces of dust, grease and finger oils must be removed from prepped area before re-gluing. Glue is applied to both surfaces and allowed to start to go off before applying a second layer of glue. Again wait for the glue to start to go off and becomes non tacky before joining surfaces. When applying glue layers to the crevices at each end of the hypalon repair, care must be taken not to put too much glue in the crevices. Too much glue in the crevices will cause a weak point in the repair. Follow glue manufacturers directions for optimum bonding of your boat tube repairing. Allow full curing time before use. For mechanical fitting RIB Tube repairs we will need to know exactly what the problem is to be able to advise on the required course of action. Again, when repairing rib tube seams, both surfaces must be sanded clean to a dull surface before applying two glue layers to both surfaces and re-joining. Allow each glue layer to become non tacky before applying second layer of glue, allowing to become non tacky and joining. See prepping instructions above and use a roller firmly to get a strong bond of the seams. Care must be taken not to put too much glue into the crevices. Follow glue manufacturers instructions for mixing and curing times. Replacement or repair of inflatable boat accessories requires the same surface preparation as described in Punctures / Tears above. That is, both surfaces must cleaned of old glue sanded and cleaned of dust residues to provide a key for the glue to attach itself. Care must be taken not to sand the tube surface down through the top neoprene layer to the fibres in lower layers of the hypalon fabric. Faulty valves should be replaced. TIDEL can supply replacement inflation and pressure relief valves on request. The method is to cut out the old valve and replace with a new valve which is fitted into a patch. We can supply valves and patches combined ready for fitting. Preparation of surfaces for glues should be carried out as in Punctures / Tears above. Please call for advice on this procedure. In the event that the rubbing strake starts to come off the tube, then again, both surfaces should be prepped as in Punctures / Tears and glue applied to both surfaces in the same way. Care must be taken not to put too much glue into the crevices at each end of the repair. Remove Grab Handle / Cleat and prep both surfaces as in as in Punctures / Tears. Again, when repairing / replacing inflatable boat accessories it is essential to remove all old glues and care must be taken not to sand the surface down through the top neoprene layer to the fibres below. Preparation is identical to Grab Handles and Cleats above. Our local area is South Devon which includes Dartmouth and the River Dart Estuary upto Totnes, Brixham and Torbay district, Salcombe and Plymouth harbour district and also the river Exe Estuary upto to Exeter. We can supply materials UK wide. Please contact us for further information on repair procedures or replacing inflatable boat accessories.